July 5th Writing Prompt: This picture is one entitled "Migrant Mother" - (Later "Destitute Pea-picking Family in Depression") taken by Dorothea Lange in 1936.It was supposedly taken just outside of Nipomo, California. Write a paragraph of her thoughts. What is she thinking? It’s been four days since we had real bread. This morning we had rice and beans, but we had to cook em all and now we sit here waitin. Jim and two of my elder boys went off to town to git the radiator repaired, but I don’t know how they’re gonna fix it without no money. We gotta have the car. Without the car, we’ll starve for sure. We came here to harvest early peas, but the harvest never came. What has come is people, and lots of em. There must be ten thousand families camped here, waitin just like us. The farmer’s association decided to send a notice to call for pea pickers all the way to the dust bowl to bring those folk in for cheap labor, but the early freeze came and destroyed all the crop. The folk from Oklahoma and Missouri came, all of em with their homes packed up in their trucks. Those folk aren’t like us; they’re pale and skinny, not used to the fields of California. Even so, they’re like us; all of us are in the same boat. Waitin and starvin together and nobody seems to care. A girl with a camera come by and says can I take your picture, do you mind? I don’t have the energy not to mind, but the little uns don’t have their faces scrubbed so they look away. One of em puts her face into my shoulder and hides, she’s so ashamed. We all are waitin, just knowin that maybe Jim might get that radiator fixed and maybe someone might give him something to eat for the kids. We might as well just sleep here tonight. The girl says thank you missus what’s your name. I tell her its Florence and she asks me what else. I can’t tell her Christie, the name I was born with; I can’t tell her Owens cuz that husband of mine died and left me to fend for myself and find Jim. I can’t tell her Hill because Jim and I aren’t quite married in the church, even if we have three kids including this baby in my arms, so I tell her – Florence Leona. My middle name is Leona and I won’t be lyin. She just nods, like she’s done askin questions. She doesn’t seem like the rest of us; her shoes have no more than two days dirt on em. She tells me don’t worry mam these’ll never git published anyway. I ask her why she doesn’t take a bigger picture, one of all the people, sittin and waitin under tents out here. That way, if a newspaper buys it the people will be forced to look at us, all of us starvin at their doorstep. If I were you, I tell her, I’d take that kinda picture. She just thanks me and walks away. I don’t have too much energy left to care about that picture. Just one picture of my face isn’t gonna make a big difference to a bunch of out here now, is it? Dorthea Lange, the photographer who took this picture, sent it and five others that she took of Florence Leona Owens Thompson to the San Francisco News and the Resettlement Administration in Washington, D.C. Papers ran the pictures almost immediately, with Lange’s report that 2,500 to 3,500 migrant workers were starving in Nipomo, California. Within days, the pea-picker camp received 20,000 pounds of food from the federal government. By the time it arrived, Florence and her nine children had moved on with her common law husband, Jim Hill, in their newly repaired car to Watsonville, California – where they were working the harvest. 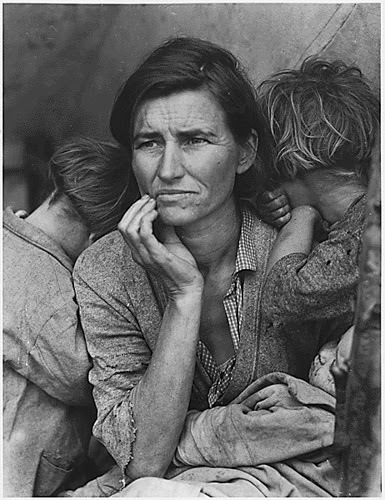 Migrant Mother, the picture of an era, is one of the most famous portraits in the USA.